(R) This has no in-depth analysis. Nothing's changed in college football in the last 24 hours. I just saw something on ESPN that really encapsulates the absurdity of the season. Look at the articles written about the four BCS bowls played so far. In the Orange Bowl, Virigina Tech, #1 in the computer ranking, is matched up against Kansas, a team with a better record than both USC and Georgia. That apparently warrants three articles, with headlines like, "Kansas Proved it Belonged". Meanwhile, the Fiesta Bowl had the most anticipated game, the only match-up between two conference champions. It is just as worthy of the national championship as Ohio State/LSU. That naturally is worth four articles. However, the Sugar Bowl, where Georgia played a team whose best victory was against Boise State, somehow warranted seven articles. And the Rose Bowl, the most pathetic excuse of a BCS game in perhaps the history of the BCS, an embarrassment to any claim the Rose Bowl has to national implications, was somehow deserving of nine articles. 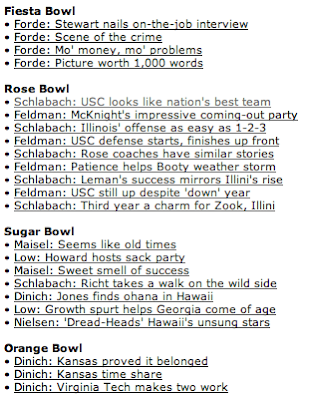 The top one is titled, "USC looks like nation's best team". Wow, they beat a top 25 team in what was essentially a home game. That's, like, an automatic national title, isn't it? You'd think the coach of the year was at Georgia or USC with this kind of coverage. You'd certainly be forgiven for thinking Georgia and USC have the best records in college football, or that they've beaten the best teams this season, or that they haven't lost to any bad teams. Of course, you'd also be wrong. Georgia, like Kansas, didn't even win its division. USC lost to Stanford, an even worse loss than West Virginia's loss to Pitt. Sports coverage is usually quite good, at least, in comparison to things like political coverage. But these guys should be embarrassed. Or they should just admit that they're not covering college football. Rather, they're partisans with a particular interest in certain schools. There's nothing wrong with that. In fact, fans are what make sports great. Just be honest about whether you're writing as a fan or an analyst. If writing as a fan, then give equal space for fans from other schools to make their case. If writing as an analyst, include all teams in your discussion. It's not like Missouri or Kansas or Oklahoma or West Virginia or Virginia Tech are clearly superior to USC and Georgia. Rather, it's that they're obviously equal to them, deserving mention in any objective analysis about the best teams this season or the best bowl games or anything else. I'm a young professional living and working in the city. I hope you enjoy your glimpse into my life. Read more about me.